To build and run for Android, you must install the Unity Android Build Support platform component. you also need to install the Android Software Development Kit (SDK) and NDK, which are required to build and run any code on your Android device. By default, Unity installs a Java Development Kit based on OpenJDK. You can install Android Build Support and the Android SDK & NDK tools when you install the Unity Editor, or add them at a later time. For information on adding the Android components at install time, see Installing Unity. For information on adding the Android components to an existing installation, see Adding components to the Editor. To enable USB debugging, you must enable Developer options on your device. To do this, find the build number in your device’s Settings menu. The location of the build number varies between devices; for stock Android, it’s usually Settings > About phone > Build number. For specific information on your device and Android version, refer to your hardware manufacturer. After you navigate to the build number using the instructions above, tap on the build number seven times. A pop-up notification saying “You are now X steps away from being a developer” appears, with “X” being a number that counts down with every additional tap. On the seventh tap, Developer options are unlocked. Note: On Android versions prior to 4.2 (Jelly Bean), the Developer options are enabled by default. Go to Settings > Developer options, and check the USB debugging checkbox. Android now enters debug mode when it is connected to a computer via USB. Connect your device to your computer using a USB cable. If you are developing on a Windows computer, you might need to install a device specific USB driver. See the manufacture website for your device for additional information. The setup process differs for Windows and macOS and is explained in detail on the Android developer website. For more information on connecting your Android device to the SDK, refer to the Running Your App section of the Android Developer documentation. Unity recommends that you use the Unity Hub to install Android SDK & NDK tools, to ensure that you receive the correct versions and configuration. Unity installs Android SDK & NDK tools respectively in the SDK and NDK folders under /Unity/Hub/Editor/[EditorVersion]/Editor/Data/PlaybackEngines/AndroidPlayer/. Warning: Unity does not officially support versions of the JDK, SDK, or NDK other than the ones it supplies. In the Editor for Windows and Linux, navigate to Edit > Preferences. In the Editor for the macOS, navigate to Unity > Preferences. In the left navigation column, select External Tools. Uncheck JDK Installed with Unity (recommended). In the JDK field, enter the path to the JDK or use the Browse button to locate it. 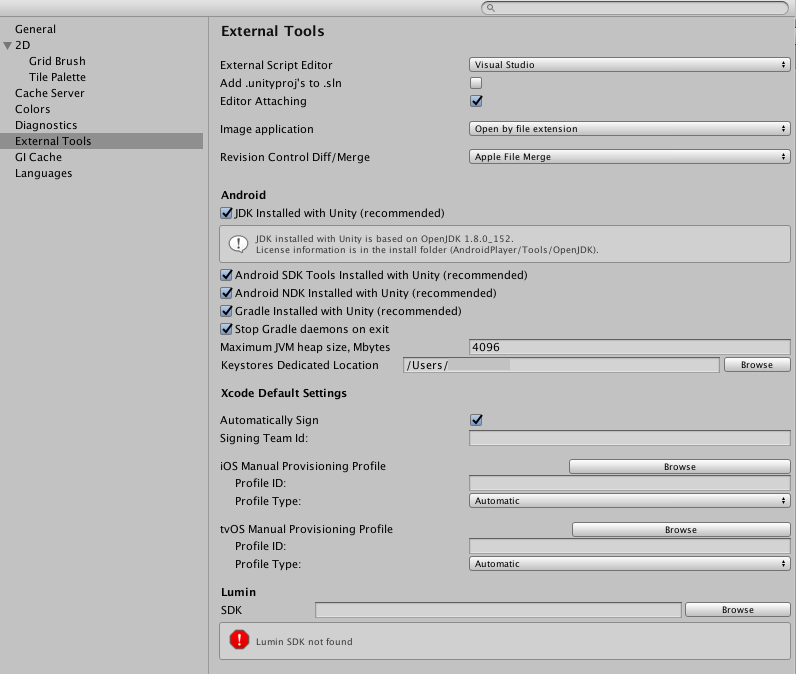 Uncheck Android SDK Tools Installed with Unity (recommended). In the SDK field, enter the path to the JDK or use the Browse button to locate it. Uncheck Android NDK Installed with Unity (recommended). In the NDK field, enter the path to the JDK or use the Browse button to locate it.